We hope this finds you well and enjoying your summer! We cannot believe how quickly it has passed by—but here we are in mid-August and we wanted to share with you a few updates. Our new play Adoption Roulette, which we are featuring for our Centennial Celebrations next year, will be having readings in Connecticut in the next few weeks. We are so excited that there has been so much interest and support in this important play about a Connecticut couple trying to adopt a child in Russia. It is good, and we cannot wait to move it forward! In addition to readings, we are actively looking for an actress to play the main character. More details as things progress. In other news, it’s that time of the year when we pack it up and head down the coast with our family for a bit of r&r before our granddaughters go back to school. During this time, we’ll take the opportunity to resend some past Newsletters of interest. That’s the news from here! It’s that time of the year—the last weeks of summer when we pack up and head down to the Jersey Shore with our daughter and two granddaughters for 10 days of beachside views and a happy vacation! As we do every year, we thought we would repost a couple of our favorite newsletters that we have shared with you in the past, so that our newest members can read them as well. 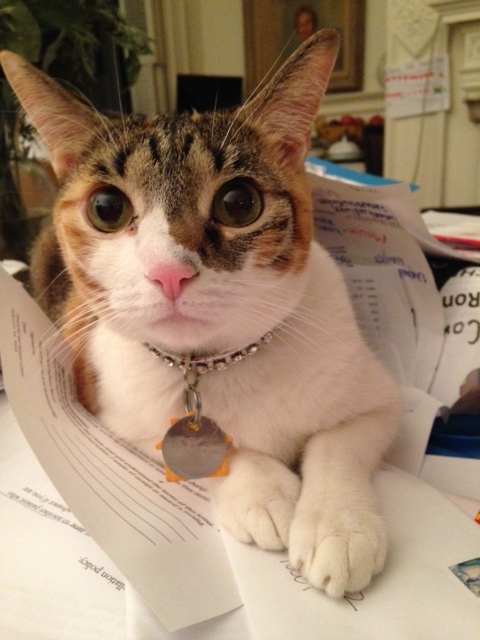 But first we thought we’d leave you with a picture of one of our cats, Undine, who is obviously ready for vacation! The Theatre Guild is proud to offer a new play reader service to playwrights! We have been successfully producing plays and working with playwrights for 95 years. Let us offer you our expertise and skill in providing feedback and editing your masterpiece play! One of the best parts of working from home is never getting out of your pajamas. KIDDING! The best parts (we think) of working from home are the wonderful moments that Marilyn & I like to call Home Office—that is a juxtaposition of home life and office life, especially involving grandchildren or one Miss Dorothy Parker, our beloved cat, so named because we found her at the Algonquin Hotel. She believes that she is helping by inspecting all boxes and anything coming out of the printer. So helpful—and gorgeous!